Who will be the next generation of farmers? Last year, the same Sunday, on January 18, 2015, Darmanto (my husband)’s article was published in the biggest daily newspaper in Indonesia. He made a book review, and also, his own book was reviewed by the editorial team. The book that he reviewed was “Aku dan Orang Sakuddei” (Me and Sakuddei) by Reimar Schefold. It was a memoar of doing ethnographic fieldworks. You can see it on the picture above, it’s the book with two people on its cover. The cover of my husband’s book, “Berebut Hutan Siberut”, written with Abidah Setyowati, was the grey one with a picture of one person squatting while looking up. Another book (the red one) was “Bebetei Uma” by Bambang Rudito, also about the same topic with the other two. Each book was about Mentawai, a tribe in remote islands west of West Sumatra. Reimar Schefold is one of the pioneer in Mentawai Studies, while my husband was one of the most deeply engaged Indonesian scholar in the field. The first time he step foot in Siberut, the biggest island in Mentawai, he was a biology undergraduate student, doing research on swidden agriculture for his final thesis under his supervisor’s project umbrella. He came in and out of the forest and became a “siripok” (a friend that is considered as a brother or part of the extended family in Mentawai). He ended up getting a job at UNESCO and spent around 8 years in Siberut plus another two years moving back and forth from Padang (the capital of West Sumatra) to Siberut. It was the time of his life, his childhood dream of becoming an “Indiana Jones” came true and above it all, he found himself. During his time there, his research won the “Man and Biosphere Award” from UNESCO. He used the prize money to set up an NGO called Pasih (Perkumpulan Siberut Hijau). The NGO was consisting of mostly native Mentawaian because my husband believe that to empower Mentawaian people, it has to be by the Mentawaian themselves. They had a great time and job when he led the organization, because he was a compassionate and committed leader who are excellent at handling interpersonal matters. Most importantly, he was open and honest to his members about everything related to the organization, including his own salary which was considerably little. This situation made everyone comfortable to work with each other and no one was having the feeling that someone else was taking advantage of their work. You know, this was one of the reason why I love my husband so much. He is sincere, transparent and without internal contradiction. He is an incredibly generous person who does everything from his heart. I know a lot of people who try to do the same thing, such as advocating for local cause or joining local people’s struggle, but what they did – although it looked the same – was absolutely different because these people have hidden agenda. They will take the credit and feel good about themselves, telling the whole world about their “heroic” endeavours and expecting some sort of respect and admiration. They went on advancing their career or degree, but when the situation of the local people that they’re trying to “help” got rough and too hard to handle, they leave. They’re nowhere to give their all. Not to mention that they did not apply the same “heroic” principles for things they won’t get credit for. My husband is different. 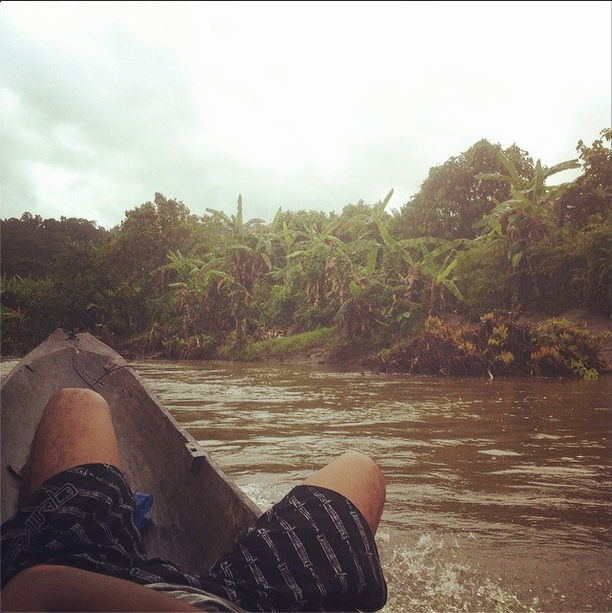 He will never leave Mentawai for the rest of his life. At least he will come once in a while, and the people will always welcome him. He still keep in touch through direct calls and the “siripok” relations is for life. It doesn’t mean that things never get tough for him. Once in a time he experienced not having any job at all, nor salary, but he stayed. And guess what he did? He farm, just the way local Mentawaians do. It was really physical and difficult but he got some muscles from the hard work opening a farm and those “unintended consequences” are really nice to hug or wrap my body around. After almost a decade in Mentawai, finally my husband applied for scholarships. His thick book (reviewed above – derived from decades of fieldnotes acquired from his long time living in Mentawai) made him an extremely interesting candidate. He was initially very “smitten” with Tania Li, an anthropologist at Toronto University, who always read and commented on his articles. Unfortunately there’s no funding available. Instead he went for a PhD under the supervision of Gerard Persoon, another expert of Mentawai at Leiden University who secured him the Louwes fund. He also got master scholarships from USAID and AUSAID. His supervisor thought it would be good for him to get more exposure to English language as well as getting a master in anthropology to make the “bridging” from his biology background more swift. Although he’s very keen to study in US, the USAID scholarship only allowed him to take master degree in Environmental Science or other technical studies. AUSAID is more flexible. The let him study Anthropology, and Gerard advised him to study under the supervision of his friend, Carol Warren at Murdoch University, Western Australia. Long story short, he’s now revising his master thesis and will continue his PhD at Leiden when we go together to the Netherlands this year. I can’t believe that our departure is just around the corner! “I often wonder how biscuits are made. I know how to make other food. In fact, all food that we eat, we make it with our own hand. That’s how it is here. But, these biscuits puzzled me, I have no idea how to make one,” said Teu Taloy. 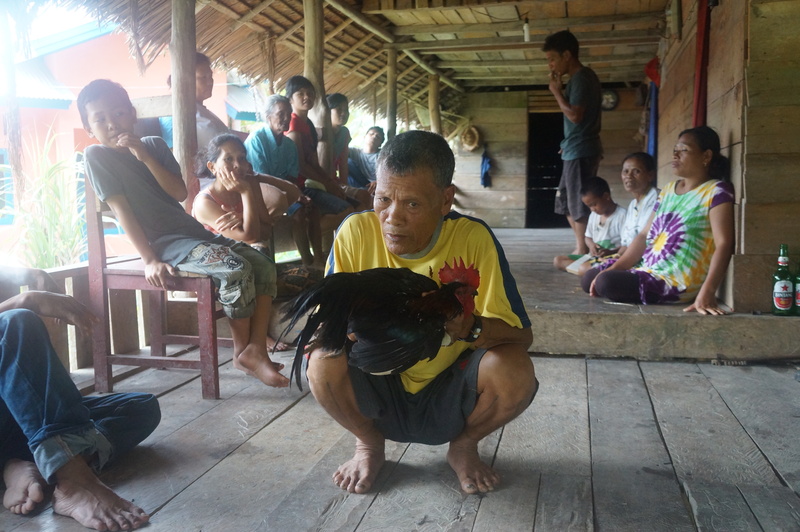 We’d recently visited Teu Taloy at his hamlet in Ugai, Siberut, Indonesia, during Christmas and New Year festivity. Our morning routine includes sitting together in front of uma, the traditional house, while eating biscuits with a cup of tea. As common as it may be, situated in context, this morning routine is a special moment. In mountainous Ugai, biscuit is a privilege. It signifies special occasion. Industrial food that needs to be purchased is unlikely to be seen in other time of the year, as people here self-provided their daily food. In this remote island best known for its internationally acclaimed surfing spots, pristine nature, rich biodiversity, and the “authenticity” of the “indigenous” people, locals eat sagoo, yam, sweet potato, and banana that are abundant and cultivated in their own family-farm. They also eat self-reared chicken and pig. Sometimes they caught fishes from the shore and shrimp from the river. Nature also provide them with endless fruit supply during each fruit season, such as mango, rambutan, durian, langsat, and cempedak. 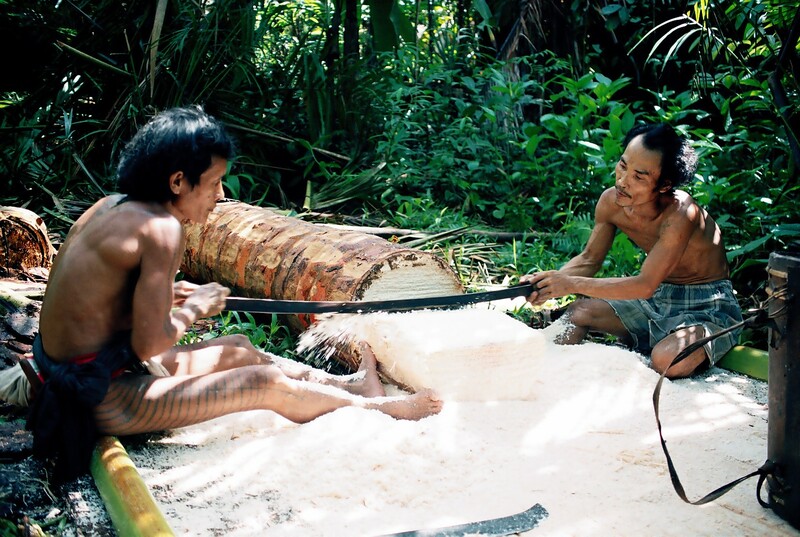 Although Siberut is a remote area, the native Mentawaian people are proud that there’s no lacking of food. Family farming is the key to self-sufficiency of food and nutrition for most Mentawaian. But, it is not just family farming. It is family farming with essential elements not to be left out. The first key element is the availability of huge land for food cultivation. Unlike other overpopulated areas in Indonesia, Siberut provide more than sufficient land for family farming. On average, each person in Siberut benefitted from 9 km square of land. No wonder, there is no need for food storage because sagoo and yam are abundant and can be collected at any time from the land. Food that is consumed directly from nature with less processing, or perhaps what is known as “organic food” in other places, are providing higher nutrition than highly processed food. Second, they consume staple food that is suited to Siberut ecological landscape. 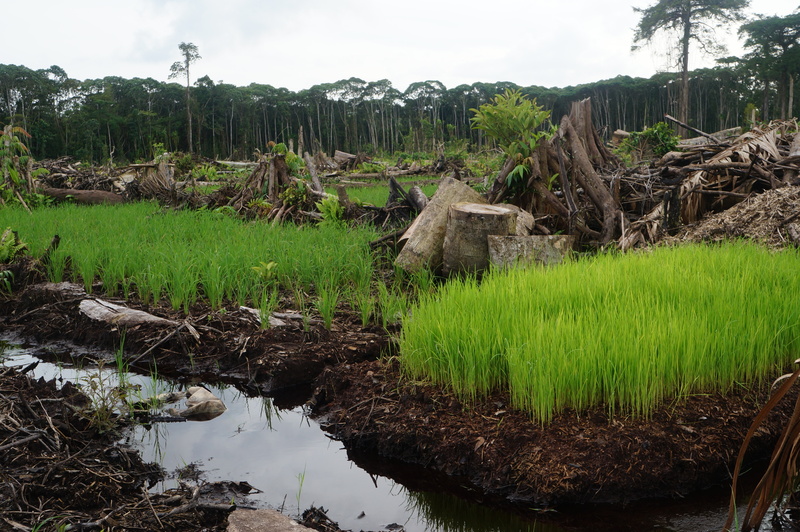 Most land for cultivation in Siberut are swamp areas. Sagoo, the staple food for Mentawaian, is perfect to be grown in this type of landscape. It does not need special treatment. 15-20% of land in Siberut is utilised to grow sagoo. One sagoo tree around 6-9 years could produce 300-400 kg sagoo and feed one family for 60-90 days. Sagoo contains high level of carbohydrate and protein with low fat. It can be stored as long as possible, hence one sagoo tree can be processed altogether at once and the production could be directly consumed for 2-3 months, reducing the need of labour to process the food at each serving time. Sagoo can be used for human as well as cattle consumption, and all parts of sagoo tree is useful, not only for food, but also for making rooftop, etc. No wonder, in Mentawaian mythology, sagoo is the most important plant and it also has social function as an item for paying dowries or gifts. Third, food security is closely linked with the custom of how family is rooted in their homeland and organized with consideration to their mode of production. The basis for primary food production is nucleus family farming, consisted of one father, one mother, and 3-9 children. Their farm depended on the labour of family members. For subsistence purpose, there is an ethic of food sharing in between members of extended family. It is common and allowed to grab food from the yard of their extended family, as long as it is for their own consumption. The situation is different for family farms in other parts of Indonesia, who could not sustain from their land, migrate to other places, have difficulties in obtaining land, become farm labour and not having the social protection of an extended family network. In Siberut, on average, food production is more than sufficient for subsistence consumption. Hence, Mentawaian in general does not farm intensively and this could free their labour to collect fish or shrimp for additional nutrition. Fourth, family farming does not mean that they are not engaged with the market. Since the seventies they have already combined commercial and food crops in their cultivation. But, engaging in market is not an imperative for family farm. Their farm for daily food provision such as sagoo and yam are distinct from the area for hard-crops or pumonean. Hence cash crop does not interfere with the area of staple food crops. Yet, usually for additional new farm, after the male open a farm, the female would plant banana and yam. Only after harvesting staple food crops would they cultivate fruit crops or commercial crops on that land. They also consider the combination of temporal and spatial factors when deciding which plant to cultivate. Looking through their lenses, Mentawaian family farming guaranteed sufficient nutrition for the people. Nevertheless, it is problematic for the mainstream way of thinking that calculates nutritional sufficiency based on one food serving unit. Other significant factor such as food sovereignty, etc are not being included in this calculation. In Siberut, you would not find one serving unit of food containing carbohydrate, vegetable, animal protein, and fruits. But it hardly means Mentawaian are lacking in nutrition. 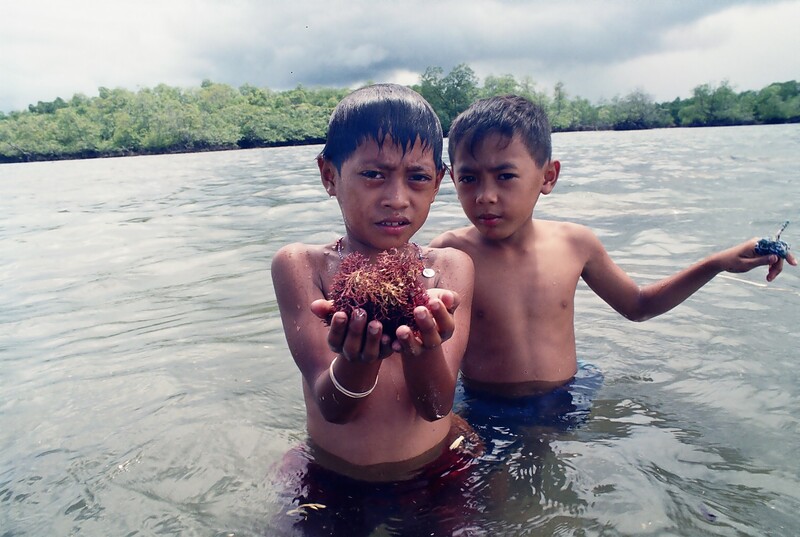 Mentawaian fulfill their nutrition intake in the basis of an agricultural cycle. For example, they regularly eat fruits during fruit season, as the fruits are abundant at its peak. During social festivities, they will hunt pigs or slaughter their self-reared pigs and share it with the extended family, making every member gets their animal protein necessities fulfilled. On a daily basis, they eat sagoo, yam and banana for energy. Being incongruent with the mainstream thinking of nutritional fulfillment brings real consequences to Mentawaian. The government who tried to adapt them into the “proper” way of fulfilling nutrition has been doing intervention to uproot them into resettlement areas. It creates dispute in land entitlement between Mentawaian groups and it also significantly reduce the frequency of people’s visit to their farm. In some cases, as the resettlement areas are limited in size, this program separates the extended family as they no longer live closely to each other. It divorced the people from one formative element of food security. The government also obliged Mentawaian to choose a formal religion in Indonesia. This makes them further being uprooted from their traditional religion, forcing them to slowly abandon traditional rituals that are used to be the moment for them to share animal protein with extended family members. The government also preferred to provide rice than sagoo while the ecological landscape in Mentawai could not support self-sufficiency in rice. It could be concluded that the government perception in seeing the Mentawaian way of family farming and nutritional fulfillment is very much distant with how the Mentawaian operates. With regard to each different context, family farming is not to be romanticised. It can work to fulfill nutritional intake in certain situation, but not always. When it is equipped with basic essential elements such as land availability, self-sufficient provision of food that suits the ecological landscape, the way society is socially organised, and the “unimperativeness” of market in their mode of production, Mentawaian case is a living proof that family farming works wonders for nutritional fulfillment. Family farming would face difficult situation when the land is lacking, the crops are not sustainable, the community is uprooted and the market has become an imperative, making farmers have to sell their labour just in order to survive. Another important point is how we view nutritional fulfillment. Instead of trying to understand the grounded way of how Mentawaian operates to fulfill their nutrition with regard to their social and ecological context, and instead of trying to convert the mainstream perception in calculating nutrition, the government insisted on converting the Mentawaian way into the “proper”, “valid”, and acceptable norm of nutritional fulfillment. This fact really left us wonder why the former is often more difficult to do. Why Indonesia’s Farmers Are Getting Younger? Our guest author, Nadya Karimasari, a researcher at Land Research Action Network opens our brand new blogging series that shines a spotlight on young people’s views and recommendations on sustainable agricultural development. This series is part of an ongoing partnership between Farming First and Young Professionals for Agricultural Development. Discussions on the role of youth in agriculture tend to be oversimplified into agriculture being unattractive. This is problematic for three reasons. First, it lumps youth together, as if they were all coming from similar contexts, overlooking the youth that are apparently attracted or already engaged in agriculture. Second, it does not sufficiently define what “farming” or “being involved in agriculture” entails, as the problem might not be the agricultural sector itself, but the types of involvement are available for youth. Third, it assumes youth will opt out for a lifetime, dismissing the flexible and multiple ways youth could be engaged. A different set of questions could tell a completely different story. In Indonesia, for example, concerns over the ongoing trends of youth leaving agriculture have been challenged by an apparent increase in reversed youth migration from urban to rural areas. What is luring these young people away from the cities, and back to farms? Research conducted by AKATIGA (2014) found that the possibility for upward social mobility is crucial to entice youth into agriculture. They are not simply attracted or not attracted to the sector, it depends on the social context they come from and what kind of involvement they are being offered. Is it farm-labour? Semi-labour with other sources of income? Or would they be the owner of farm? 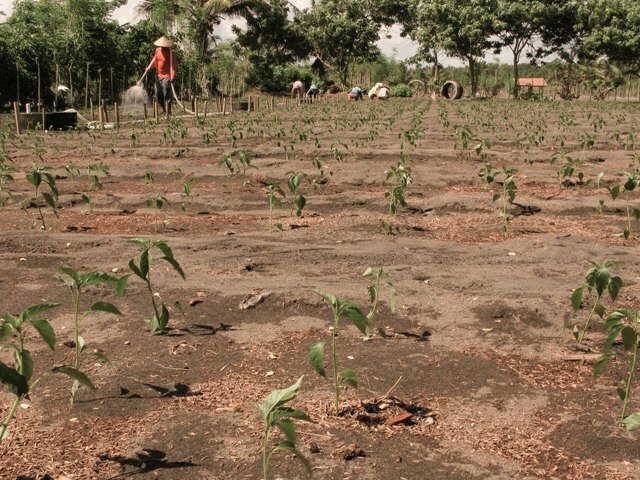 In the sandy coastal area of Kulon Progo, Yogyakarta, youth are increasingly coming back to agriculture. The main reason has been the overwhelmingly high yields of chilli and watermelon and the subsequent high farmer income, in contrast to the precariousness of the labour market in urban areas. The marginality of land enabled landless people, including youth, to get their own plots, fulfilling the desire for upward social mobility as mentioned above. From labouring for someone else, or worse still in precarious employment in the city, they are becoming self-employed and have more control over their livelihood. This feeling of independence is also enhanced by the inputs and technologies used on the farm, with these young farmers preferring simple, self-made technologies, seed-sharing mechanisms and organic fertilizers. Good production alone is not sufficient, as it could be overshadowed by failure in the market. To conquer the market, through their own local grassroots organization, these farmers manage the timing and period of planting in order to gain sustainable harvest throughout the year. This way, the tendency to overproduce during high season that makes price very low can be avoided. They also keep the price high through farmers auction. Conventional ways of selling through “tengkulak” or middle men was proven to result in very low price for their produce, favouring the profit for the middleman. Instead, these farmers organize auction events, where the buyers must put their bid inside an envelope, and those who offer the highest price could buy the produce. These farmer organizations allow the farmers to “raise each other up” by getting the best price guaranteed for their produce. Organization is key for farmers to gain more control over their livelihood. Its networks can provide information on potential land for farming and assist farm set-up. It also supplies better peer-to-peer information on what crops most suitable to be planted, where to get inputs, what type of supporting technology is most appropriate and affordable, and howto make the best out of their activities. If the rest of the world can follow Indonesia’s example, perhaps many more youth would see farming as a viable career. By promising upward social mobility, high yields on good land and strong access to market through effective organisations, perhaps farming would not be seen as such an “ugly” profession after all.